Groundwork for the formation of the Lymphedema Association of Manitoba (LAM). LAM drafted its by-laws; incorporated under the Corporations Act and will be seeking charitable status. Its inaugural meeting of members was held in May, with the later appointment of the LAM board. Theresa Oswald, Minister of Health has proclaimed March 6 as Lymphedema Awareness Day. March 8, 2013, the Lymphedema Association of Manitoba hosted a provincial stakeholders meeting and on the 9th, their 1st annual Lymphedema Awareness Day Symposium. It was an exciting two days of events and connected many sectors of the lymphedema community in Manitoba. The stakeholders meeting, brought together a wide variety of Manitobans with an interest in lymphedema and lymphedema management. It was the first public education meeting from the perspective of lymphedema patients and professionals. The day was spent identifying problems and brainstorming strategies for making advances in the recognition of lymphedema and related disorders. A day of true collaboration identified and brought together the individuals and organizations that will shape lymphedema awareness and treatment in Manitoba. At the Symposium, speakers presented information about lymphedema and various aspects of treatment and management. Vendors were also on hand to showcase the wide variety of products that are now available to help patients and therapists cope with lymphedema and related disorders. From compression garment fitters to researchers, the lymphedema patients, therapists and other members of the lymphedema community benefited from the sharing of information and ideas that are current regarding this under recognized condition. It was a momentous day for lymphedema in Manitoba. The Lymphedema Association of Manitoba has taken a big step in shaping the future of lymphedema care in our province. The LAM is so thankful to our speakers, sponsors and exhibitors and all that attended our first annual symposium. March 8, 2014 hosted our 2nd Annual Lymphedema Awareness Day Symposium in Winnipeg. March 8, 2014 - Lymphedema Association of Manitoba Provincial Stakeholders' Meeting held in Winnipeg, Manitoba. The LAM Stakeholders' meeting was of discussion and collaboration of ideas. 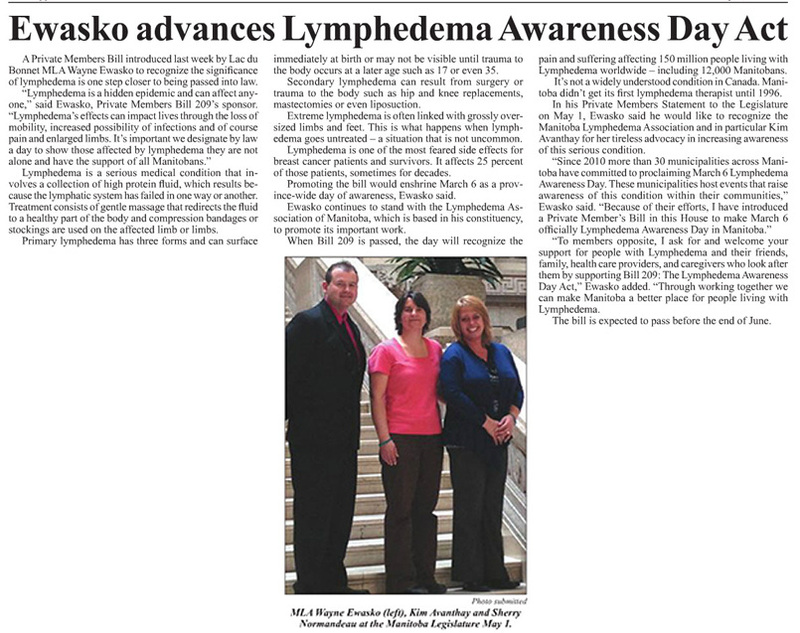 May 8, 2014 news article featuring the LAM with a Private Member's Bill in the House to make March 6th Lymphedema Awareness Day! June 12, 2014 - Bill 209, Lymphedema Awareness Day Act, proclaims March 6 in each year as Lymphedema Awareness Day. October 22, 2014 - A "Halloween Howl" Bud, Spud & Steak Fundraising Dinner was held. Thank you to all who donated and attended making the fundraiser a success! March 2015 - Over the past year I have witnessed the commitment of the incredible LAM Board of Directors, the LAM membership, Professional Advisory Committee, supporters, volunteers and symposium speakers and vendors. Without your continuous help the LAM wouldn't exist. I would like to take a moment to acknowledge and thank Kim Avanthay, Co-Founder and now Past President of the LAM for her dedication and contributions during her term.? We are delighted to announce the LAM Board of Directors for 2015/2016; Debbie Davidson - President, Kim Avanthay - past President, Isabelle Thorvardson - Vice-President, Susan Tole - Secretary, Sandy Funk and Suzanne Paintin - Directors. Let us all look to the year ahead with much optimism as our journey continues...breaking down the barriers. On March 14, 2015 - 3rd Lymphedema Awareness Day Symposium, at Hilton Winnipeg Airport Suites. "Our Journey Continues...Breaking Down the Barriers"
Keynote speaker is Mitch Dorge ~ Life, It's Awesome. An award-winning musician, producer, and member of Winnipeg's Crash Test Dummies, Mitch is one of five individuals profiled in "W5 presents - Pursuit of happiness". What makes him so happy? Thank you to our gold and silver sponsors and seeing all the exhibitors. Ultimately, our goal is to give lymphedema audiences a voice, interactive knowledge and supported connection to know that they are not alone on this journey. . .
Our speakers had so much information for us. Keynote speaker - Nicole Foster, from Season Two of the Amazing Race Canada - Live an amazing life! Was held on Friday and Saturday, March 10 and 11th, 2017 at Deer Lodge Learning Centre. Dr. David Keast Our headline speaker is currently the president of the World alliance for Wound & Lymphedema Care and Director of the Canadian Lymphedema Framework. Dr. Tom Hack He is a Professor in the Faculties of Nursing, Medicine, and Graduate Studies at the University of Mantoba, and a clinical psychologist with CancerCare Manitoba and maintains a clinical practice in the Department of Patient and Family Support Services at St. Boniface hospital.